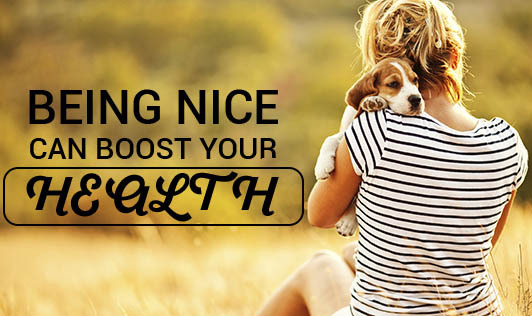 Being nice can boost your health! Did you know that the benefits of being nice range from good emotional health right down to healthy cardiovascular and nervous systems? Psychologists have coined the term "helpers high" after a survey found that charity volunteers felt happier. Acts of kindness release a hormone known as oxytocin which is a cardio-protective hormone. It binds the lining of the blood vessels and causes dilation of the arteries which improves blood flow. It protects the heart by lowering blood pressure. • Scientific studies have also shown that people who are kind, altruistic and compassionate live healthier and longer lives. Everything from life satisfaction, self-realization and physical health is significantly improved and mortality is delayed. • Each time you do an act of kindness, your brain repays you with a rush of endorphin fuelled euphoria that is usually followed by long-lasting serenity. It is also said to reduce chronic pain, so try to introduce kindness into your daily routine to maintain good health. • Acts of kindness can also reduce anxiety helping one become a happier person. It increases relationship satisfaction. • It boosts your mood. Studies have shown that acts of kindness will increase levels of serotonin in your brain, the neurotransmitter being responsible for good mood. To experience these benefits, you don't have to go out looking to change someone's life. It can be small things such as making a cup of tea or pay a compliment. Something that you wouldn't usually do, but will make a difference!